The majority of hoteliers last week voted that ‘Minimum Room Rates’ must stay, saying a change would spell doom for an already struggling industry owing to a multitude of reasons. Colombo City Hotels Association President M. Shanthikumar confirmed that at a meeting held on 23 August with over 25 Colombo star class hotels, the majority of whom, excluding two members, clearly stated that they wanted the Minimum Rate policy continued and predicted doom in Colombo city if the Government decided to revoke the Gazette notification at this juncture. However, the members clearly requested a robust monitoring mechanism to be put in place by the government authorities to control the violators, Shanthikumar added. The emergency meeting by City Hotels followed Sri Lanka Tourism announcing moves to do away with the Minimum Room Rate, first introduced nine years ago. The original Gazette stipulating the Minimum Room Rates scheme for city hotels had expired on 31 March 2018 and since then room rates had plunged drastically, especially at five stars, sending shockwaves throughout the hospitality industry. Some estimate that rates have come down by 40% from $ 125 to $ 80 per night with fears they could dip to wartime levels of $ 50 or less. However, inbound tour operators have welcomed the development on the basis that Colombo has hitherto overpriced itself, making accommodation in the city too expensive for tourists. Tourist Hotels Association Chairman Sanath Ukwatte countered by saying that what makes Sri Lanka and Colombo expensive is the high taxation which is 30% as opposed to around 10-15% in competing destinations. He said that the Minimum Room Rate did not seriously impact overall tourist arrivals as the leisure segment accounted for only 20% of city hotels. “Undercutting and a drastic drop in prices doesn’t augur well for Sri Lanka as it damages the brand image and the country loses foreign exchange earnings. Furthermore, it impacts hotels’ profitability which in turn affects government tax revenue. Once rates drop sharply they will be difficult to increase. City hotels mainly cater to the business traveller and corporates, a segment which isn’t too sensitive to higher rates,” Ukwatte argued. Shanthikumar emphasised that the hotel industry was the single largest investor in the tourism sector and Colombo had seen some of the biggest investments in the country, with city room strength being over 30% of the entire country’s room inventory. It is predicted that in the next three years over 40% of Sri Lanka’s inventory will be in the commercial capital of Colombo. He said that minimum room rates benefitted not only the hoteliers but the staff, owing to a higher service charge, as well as the Government. It was pointed out that since 2011 the Minimum Price stipulated has not been revised but hoteliering cost of operations had increased dramatically over the past seven years. “With the economy not seeing any type of boom and the leisure sector, including the MICE business, being relatively depressed, Colombo hotel occupancy too is on the decline. The large number of new inventory coming into operation in Colombo with no demand growth to compliment the inventory growth, there was definitely a valid reason for our members’ concern,” City Hotels Chief added. According to Shanthikumar the results released by some leading leisure companies were a testimony to the pressure in business of the tourism sector in Sri Lanka. “The Government at this juncture must realistically assess the status quo rather than rushing in to remove the Minimum Room Rate. To ensure the hotels stick to the policy, the Government must introduce a proper monitoring mechanism on the Minimum Rate,” Shanthikumar added. Tourist Hotels Association Chief Ukwatte insisted that the Government should defer any final decision until the new destination branding and marketing campaign was rolled out and its effectiveness proven. “We are glad that Tourism Minister John Amaratunga has announced that the new campaign will be unveiled later this year. We are confident that the Government and relevant parties will come up with an effective exercise. Until then and results are proven the Government shouldn’t rush,” he added. The THASL has long been lobbying for lower taxation as one of the means to make Sri Lanka attractive to tourists as well as keep the industry afloat. The industry has also been demanding that the non-tax-paying informal sector be properly regulated. However, Sri Lanka Tourism officials insist the time is right to remove the Minimum Room Rate. 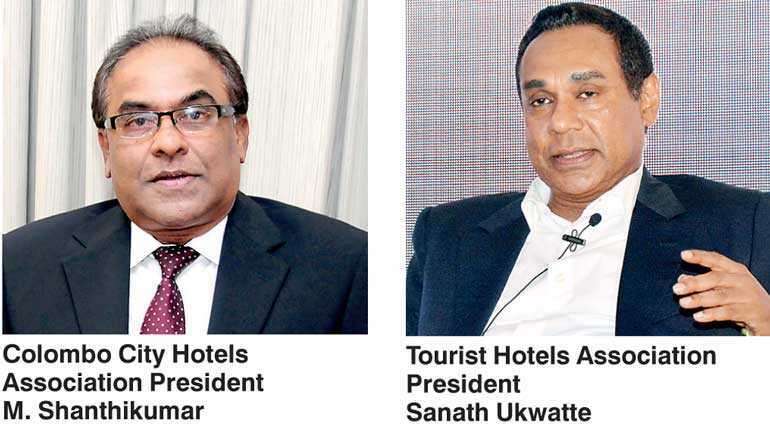 SLTDA Director General Upali Rathnayake insisted that the SLTDA Board arrived at a decision to remove the Minimum Room Rate for five-star hotels in Colombo at a meeting held in July and the authority will Gazette the decision soon. “We found that after nine years there is sufficient capacity in the capital and the market is not driven by the price but the quality and services they offer. Considering these factors, the Board decided it was not the right mechanism to control the prices with a minimum rate,” he told the Daily FT recently. He pointed out that the minimum rate was introduced to the market at a time when city hotels were finding it difficult to continue business.